Tyler has a problem. He let a friend copy his math test, and he’s afraid his mom will find out and ground him forever. He learns SMART Choices – a simple 5-step process that is fun to learn and easy to use – and discovers a creative solution to his problem. 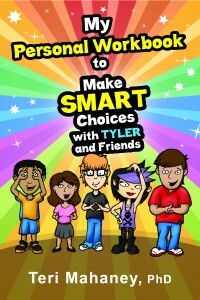 He teams up with friends, and they help each other make SMART Choices about their problems too. 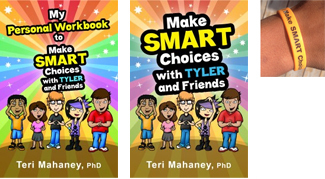 The SMART Choices team – Tyler, Maria, Ethan, Tomiko, and Dakota- guide readers through a progression of learning activities, which are designed for different learning styles. Readers can work at their own pace to practice each step of the 5-step process, and develop the skills they need for making SMART Choices. Reward kids who read the book and complete the workbook. 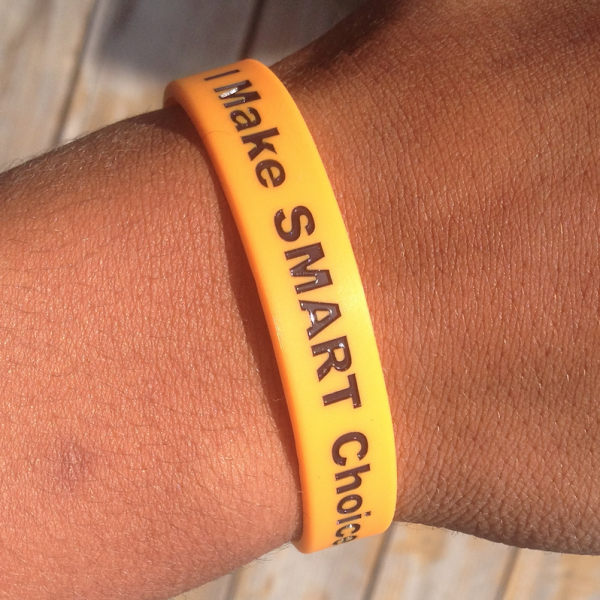 Get them an I Make SMART Choices bracelet. For bulk orders, collaborations and fundraising opportunities, email us! Kids should read this book because it shows how to take responsibility. This book was very inspirational for me. I loved how it was based on real teen times. And how they were put to the test to choose the right thing. I hope that more teenage girls read this book and I hope that they will love it as much as I did. Fabulous… absolutely fabulous. It should be used in classrooms. I really liked your book. I think people will actually use the SMART process to solve their problems. It’s a great book and very useful. Every classroom should read this book and understand the importance of planning and smart decision making. It is very interesting – fluent and precise – and describes how kids should plan their futures. SMART Choices should be available to every middle school student. It is fun and light – with problems and vocabulary that are familiar to all youth. It would be a great resource for parents! And if offers a free program for bullied youth: www.healbullying.org. Tasha really enjoyed working through SMART Choices, she even applied it to her ambitions of going to college. I will certainly use SMART Choices in the future and use it to assist others. Thank you, Teri, for writing it. Kids should read this because it could really help them with their problems. Young people will read this book because it is about them. 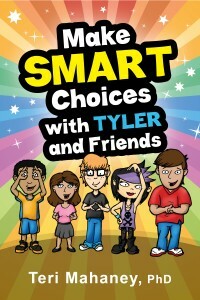 They can see themselves and relate to the dilemmas and predicaments Tyler and his friends work through. Thanks for teaching our kids to think and problem solve. Well-done Teri!